Not only can you restrict access to the Mosquitto MQTT broker using a username and password you can also restrict access to topics. Unless you are running an open broker you will want to restrict access to topics so that only authorized users/clients can publish or subscribe to them. Topic restrictions are configured on the Broker, and there is nothing to configure on the client. Topic restriction is done in an access control list ( ACL ) file. To enable topic restrictions you need to edit the mosquitto.conf file to use it. Note: You should create a copy of the default file as a backup before you edit it. A default file ( aclfile.example ) is provided with the installation. The default ACL file is very restrictive, and if implemented as is, would deny access to almost every topic to every user and client. The general rule is that, by default, you are denied access unless explicitly allowed. Entries here start with the keyword topic and apply to all clients except if the client provides a user name. If the client provides a username then entries in this section are ignored for that user. This gives read (subscribe) access to any client that doesn’t supply a username to the topic $SYS/#. Any client trying to subscribe or publish to any other topics e.g. house/sensor1 would be denied. This section uses the keyword user. This entry only apples if the client supplies a username otherwise it is ignored. The entry means that a user named roger can publish and subscribe on the topic foo/bar. No other user can publish or subscribe on any other topics. Every client will provide a client ID. Entries in this section will only apply to the client with that Client ID. However entries in the General section and User section will also need to be taken into consideration and could allow more access. The user id is used in a similar fashion. Unfortunately it is not easy to detect ACL restrictions as they aren’t notified to the client. This means that if a client subscribes to a topic and is denied by the ACL then the client doesn’t know it has been denied as it receives a positive acknowledgement. The only way you can really detect a problem is by subscribing and publishing to a topic and detecting or not detecting the published message. In the detailed examples below we look at topic restrictions using the general settings. Later we look at User and client settings and how they are used to control topic access. In the examples below we will use a simple python script to subscribe and publish and examine the results on the python client and on the broker console. Subscribe and Publish to a topic with no ACL configured. Subscribe and Publish to a topic using the default ACL file. 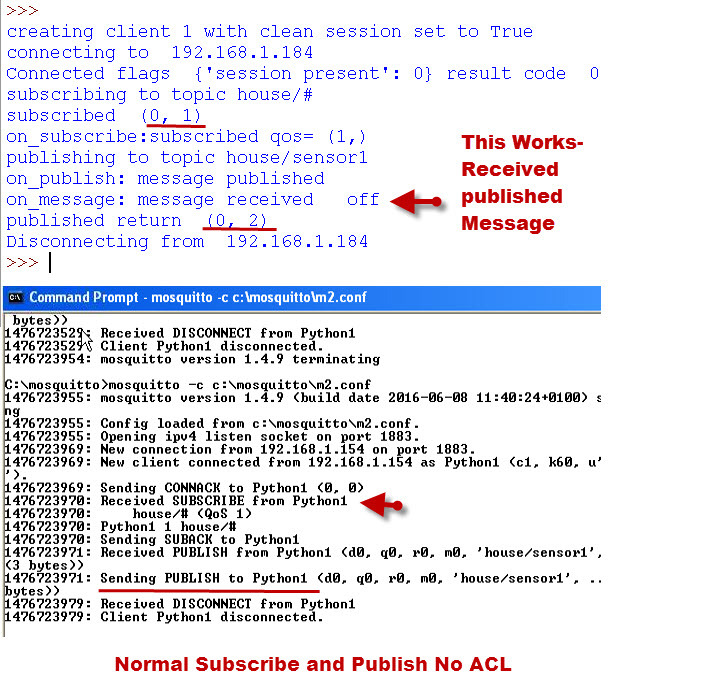 Edit the default ACL file to allow subscriptions and then Subscribe and Publish to a topic. Edit the default ACL file to allow subscriptions and publishing and then Subscribe and Publish to a topic. In each case we look at the various return and error codes shown by the client script and on the Mosquitto broker console. For the examples I have enabled logging of all error messages on the broker. 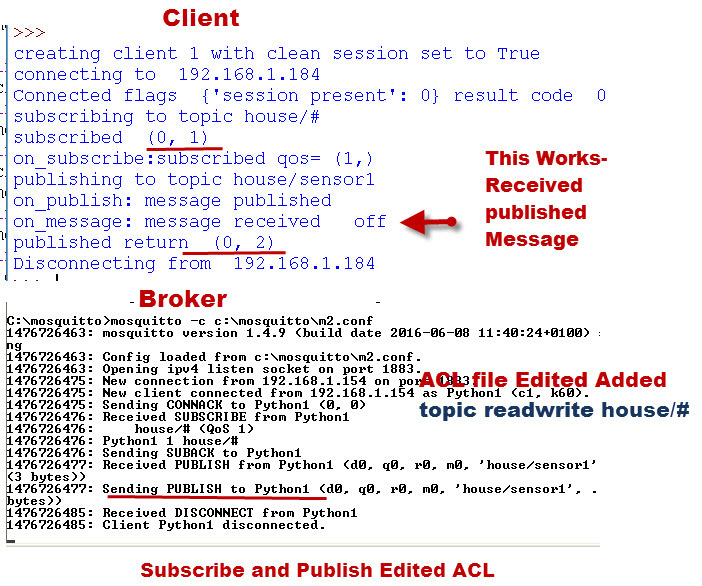 Example 1-Subscribe and Publish to a topic with no ACL configured. With no ACL being used then we are free to subscribe and publish to any topic. The screen shots below show that the messages we publish are received. Example 2- Subscribe and Publish to a topic with the default ACL configured. 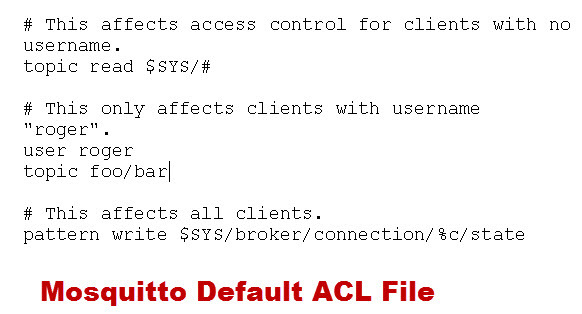 With the default ACL being used then we are restricted to reading the #SYS topic. The screen shots below show that the messages we publish are not received which is as expected. However notice that the subscribe return code and publish return code indicate success. However the Mosquitto server console logs a published denied message. Example 3- Subscribe and Publish to a topic with an Edited ACL . However notice that the subscribe return and publish return codes indicate success. Example 4- Subscribe and Publish to a topic with an Edited ACL. 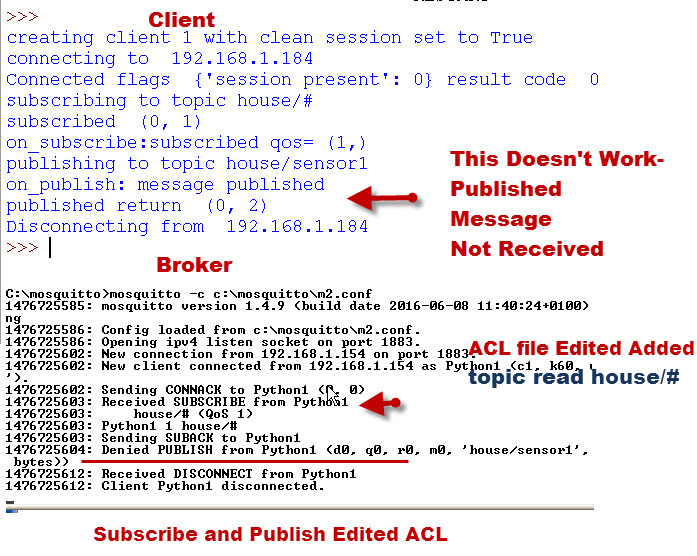 This time we edit the default ACL to allow anyone to subscribe and publish to topic house/# . The screen shots below show that the messages we publish are received, which is as expected. This time the Mosquitto server console logs the message being sent back to the client. User restrictions are triggered when the client provides a username. If a username is provided by the client then the ACL list is checked for that user. Username restrictions will override General restrictions. This means that if the General settings allow access to that topic, if the client provides a username, and that username doesn’t have an entry in the ACL explicitly giving access to that topic, then they are denied. Client settings usually use the client ID as part of a pattern match. This setting will allow a client with client id python1 to publish and subscribe to topic house/python1/#. Client python1 will not be able to publish and subscribe to topic house/lights/#. Client Settings and General Settings are additive. This means that if the client settings don’t allow, but the General settings do then, it is allowed. Client Settings will override User Settings. This means that if clients settings allow a client to publish/subscribe to a topic then they are allowed regardless of the user settings. Only user roger can publish and subscribe to topic house/#. If the client doesn’t send a username then the client can publish and subscribe to all topics -entry readwrite topic # in General settings. If the client name is Python 1 then that client can publish and subscribe to topic house/Python1/# regardless of the username sent. However only user roger can publish and subscribe to topic house/P1/#..
Topic names and usernames are case sensitive. User roger isn’t the same as user Roger. Topic house/Python1/# isn’t the same as house/python1/#. Q- How do I know if my published message has been denied by the broker or just lost? A- You cannot tell from the client. Q-Does the user in the ACL user section need to be added to the passwords file? A- No, not for the ACL to work, but it does if you are also using username and password authentication. You can restrict access to a broker by configuring Access control. Access control can be applied to users,client ids and topics. From a client perspective is isn’t easy to know if access control is being applied as restrictions aren’t notified to the client. when I should edit mosquitto.conf or /etc/conf.d/default.conf? You should edit the mosquitto.conf file. When testing I create a new conf file and use that as it is easier than editing the mosquitto.connf file as you need su permission. Hello Steve! When I put the acl_file entry on conf.d/default.conf, it stops all authentication: nothing can even connect to the broker. Why? Can you use the ask steve page and send me the file as I’m not familiar with it. Thank you so much sir for sharing valuable knowledge. Great article, very informative. Is it possible to deny access by IP Addresses? Or to only allow access to specific IP Address? Glad you found the article useful. You cannot restrict access by IP address using the mosquitto.conf file. In a way it is not surprising as client IP addresses can change. If you needed to do that then you could use IPtables on Linux. Steve, thank you for the comprehensive tutorials. Extremely well done! Thank you for the article. It is very imformative. I was wondering is there any way to use external service as acl data provider. I mean in this example broker loads file. But you have to reload it every time acl change a happens. Would it be possible to use database to check acl? Not as far as I know but the broker is being upgraded to support mqtt vs 5 and things might change then. 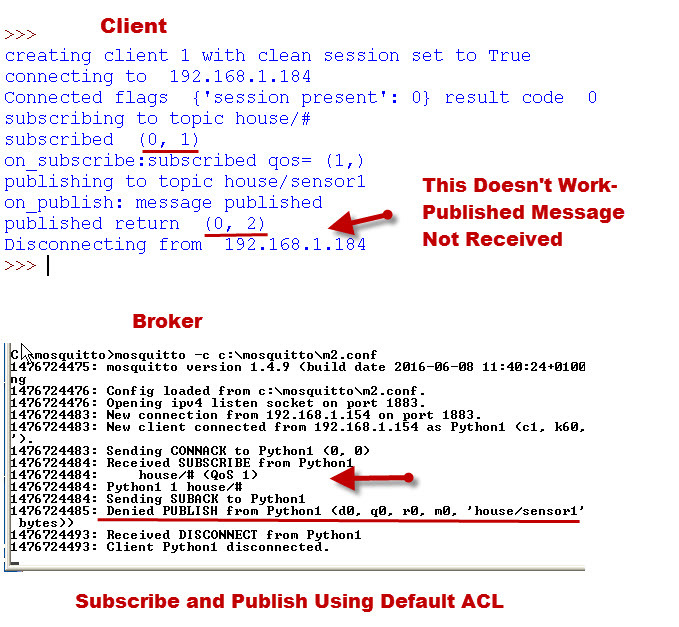 Does the broker return anything that lets clients know whether their messages get denied? Not in current version but I thing inversion3.5 it does. Thats part of the official specification. Do you have idea for prevent sinscribe user in other topic for many users? You probably need to think of a different solution with so many users. I doubt if mosquitto would handle them. Hi, Steve. For the example 4, I’ve commented all other setting in ACL file and add in “topic readwrite house/#” but when I publish, the broker still denied the publish. Do you have any idea about this? BTW, i’m using the windows command prompt console to do the testing and my ACL file only have the setting I mentioned above, if this could be the cause. @Steve. A very good explanation. Is there as way in which we could deny a user from publishing to a particular topics only while he/she has access to other topics. What I want is explicit deny instead of explicit allow. ” Entries here start with the keyword topic and apply to all clients except if the client provides a user name. the above sentences are not clear. what do you mean from “username” ? username in the CONNECT message or in the GENERAL section of the “acl_file” ? username in the connect message. If you look back to the password tutorial you can supply a username and password from the client but if the broker is set for anonymous access, and has no passwords file set the the broker ignores it. However that username can be used for access control. what do you mean from “outline” and “ouline” in this expression?